Students in the Delaware Hayes marching band practice their drill Thursday afternoon and play their instruments while moving to their next position. The band will practice their moves over and over until each member has the movements memorized for the entire show. 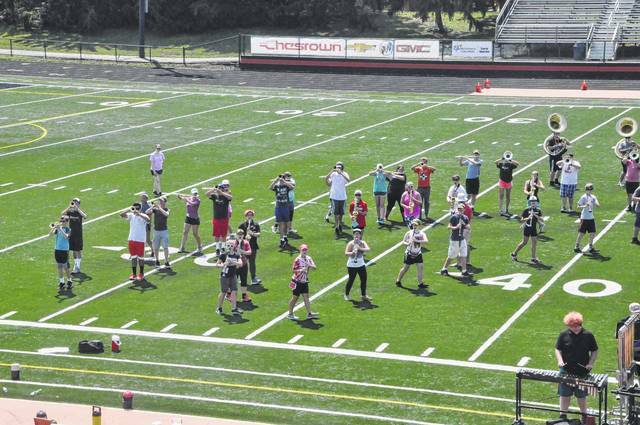 Students in the Delaware Hayes brass section bring their instruments to attention before practicing another maneuver Thursday afternoon at Cornell Stadium. After a countdown from Drum Major Kara Hardison, the Delaware Hayes High School Marching Band snaps into action, playing and moving around the field. A few measures later, the band freezes in place and Band Director Andy Doherty gives notes and directions with a loudspeaker from the top of the bleachers. “Look at your lines!” Doherty barks at his musical troops. The band members look down at their positions and make adjustments. Doherty calls for the band to practice that move again and the more than 80 members hustle back to their positions. The sun is at its zenith and the students are baking in the hot sun, but the second they hit their mark they snap to attention, ready for another drill. Doherty says they only have an hour to use the football field before the football team returns and they have to make the most of it while they have it before they go back in parking lot to practice their drills and movements. 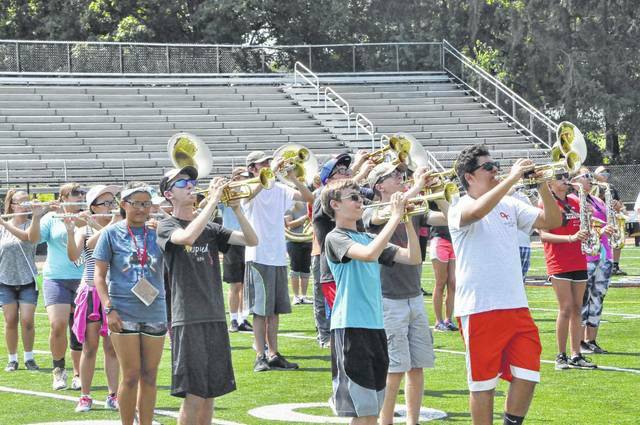 While most Delaware City Schools students spent their last week of summer break relaxing, the members of the Delaware Hayes High School Marching Band spent the week sweltering under the sun at band camp. Gemberling said band camp not only gives the band time to practice the music and the drill, but also gives the students a chance to form new relationships. Gemberling said it’s especially good for freshmen to make friends at band camp because they will start high school and already know some upperclassmen. Doherty said that even when the band finishes their 12-hour band camp days, the band will practice on Monday, Tuesday, Thursday, and Friday during the school year for at least two hours a day. Hardison, a senior, is the band’s drum major and is in charge of keeping the band’s tempo and managing practice, which involves a lot of yelling. “I’m not a super loud person, so I had to learn how to yell,” Hardison joked during a break in practice Thursday. Trumpet section leader and senior Tyler Smith said band camp is hard, but helps the band to improve, physically and musically. Noah Goulet, a junior clarinet player, said it’s the best week of the year. Beth Cline, the secretary of the Cadence Club, the band parent organization supporting the Delaware City Schools bands, said the band will be participating in four or five competitions this year and reported that last year the band participated in five marching band contests throughout Central Ohio, all of which resulted in Superior ratings. Cline said the band qualified for state Ohio Music Education Association marching band contest where they participated and received an Excellent rating. “It’s looking to be a great year,” Doherty said. Glenn Battishill can be reached at a 740-413-0903 or on Twitter @BattishillDG. This entry was tagged delaware city schools, delaware hayes high school. Bookmark the permalink.